Panama is the southern most country in Central America bordered by Costa Rica to the north and Columbia to the south. It is an S-shaped country that connects the Pacific and Atlantic Oceans by means of the Panama Canal, one of the greatest engineering feats of the 20th century. The canal isn't just a waterway. It consists of a strip of land above sea level that has been isolated by dams and locks and flooded. Giant ships are lifted up through a series of chambers, are let into the canal from the Pacific or Atlantic, navigate the 50-mile canal and then are lowered down to the other ocean. Ships pay upwards of $150,000 for passage through the canal. 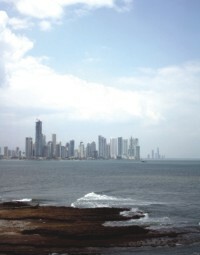 I spent a week in Panama in April, 2009. I definitely wanted to see the marvel that is the Panama Canal, but I also wanted to learn a little bit about this isthmus (narrow strip of land) that connects the continents of North America and South America. The Atlantic Ocean to the north is actually lined with archipelagos of Caribbean islands. And to the south are Pacific beaches with white sand and warm water. I found Panama City to be one of the most cosmopolitan cities in Latin America. Full of high rises, businesses and banks in an upscale centre called El Cangrejo, it seemed more like Miami. I stayed with a Panamanian family in the district of El Cangrejo. My host Angeles was an elderly lady from Spain in her 70s. 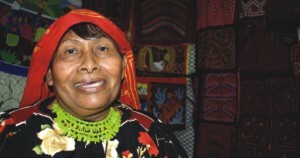 Panama is full of immigrants from all over. Angeles was a gracious host full of stories of her travels. I attended a Spanish school called “Spanish Panama” in the same area, about a five-minute walk from Angeles' home. At the school I had six teachers in a span of four days! The advantage was that I was able to get several perspectives on the country and I learned a lot about the history of Panama. A lot of people in Panama speak English. This is in part due to the presence of the canal. A lot of foreigners came to help in the construction of the canal even from as far away as India and Pakistan. The United States invaded Panama to overthrow Noriega. They had a huge presence in Panama, controlled the Panama Canal and had several military bases in Panama. But during Carter's presidency the United States gave the canal back to Panama and the bases were also shut down. The US has definitely left its legacy behind the national sport is Baseball, not Soccer as in the rest of Latin America. Panamanians use the word “prity” to express a good feeling, the way “cool” is used in English. Again, an influence of the North Americans in this Latin American isthmus. I wanted to take a tour of Portobello (The beautiful port), one of the first Spanish fortifications built by the Spaniards in the New World. But unfortunately I would have to travel along the “Transistmica” the highway across the isthmus and it would be costly. Due to its status as a financial capital Panama is a bit more expensive than other Central American countries. In fact the official currency the Balboa is hardly used and the Dollar is used instead. A tour to Portobello through a tour operator would cost $160, more than I was willing to spend. On a whim I hailed a taxi and asked the driver if he was willing to take me on a tour of Portobello, the Caribbean beaches and the Gatun Locks (the Panama Canal on the Caribbean side). We settled on $80. I was in luck. My taxi driver Julio was honest, dependable and his taxi was reliable. As an added bonus he had tale after tale to tell me. He used to work for the US military and spoke decent English, so we communicated in both Spanish and English. He got to practice his English and I, my Spanish. He was trained as an Electrician, a well-educated Panamanian. Portobello is built on a bay, offering protection from attackers. The fortresses still have the centuries old canons pointed out to the bay. These days the fortress is an ideal place for a pick up game of soccer or for tourists to hang out. The atmosphere is relaxed a sign that we must be on the Caribbean. Boat tours are available to take you out around the Bay and to the Caribbean. It was well worth it you could see Portobello from the invaders perspective, with all the canons pointed towards you. Sir Francis Drake attacked Portobello and perished here at sea he is buried somewhere near the entrance to the bay. The Welsh buccaneer Sir Henry Morgan also invaded Portobello in 1668. After ransacking Portobello, he and his men traveled all the way to the Pacific, looted and destroyed Panama City. After a tour of Portobello I visited the Gatun Locks where the Panama Canal meets the Atlantic Ocean. Again I marveled at the technology and marveled at the creative genius of man to be able to separate the Americas into two no small task! “Prity” Panama has certainly been influenced by the presence of the canal and owes a lot of its prosperity and cosmopolitanism to it.